Soldiers on the frontline or at remote bases time and again have to wait weeks for critical replacement parts. Presently, researchers state they have discovered a way to fabricate a number of these parts within hours under combat conditions using cardboard, water bottles, and other recyclable materials located around the base as starting materials for 3D printing. They say this 'game-changing' progress could decrease dependence on outside supply chains, enhance operational readiness, and heighten safety. The scientists are presenting their findings at the 256th National Meeting & Exposition of the American Chemical Society (ACS). ACS, the world's largest scientific society, is hosting the meeting this week. It comprises over 10,000 presentations on a wide variety of science areas. Ideally, soldiers wouldn't have to wait for the next supply truck to receive vital equipment. Instead, they could basically go into the cafeteria, gather discarded water bottles, milk jugs, cardboard boxes and other recyclable items, then use those materials as feedstocks for 3D printers to make tools, parts and other gadgets. Providing combat troops with food, ammunition, fuel, and repair parts is a colossal task, requiring numerous support staff, manufacturers, and contractors. In all, the U.S. Department of Defense has an inventory of 5 million items dispersed via eight distinct supply chains, according to the U.S. Government Accountability Office. However, few of these things are hoarded at front-line locations, meaning that troops in those places can experience intermittent shortages of crucial materials. Several of these units have 3D printers that can create spare parts and other equipment, but they depend on conventional feedstocks, such as commercially available plastic filaments, that must be requested, and they can take days, weeks, or even months to reach the base. Recently, Zander, U.S. Marine Corps Capt. Anthony Molnar and colleagues at the U.S. Army Research Laboratory investigated the possibility of using recycled polyethylene terephthalate (PET) plastic as a starting material for 3D printers. PET plastics, found in soda and water bottles, are typical waste materials found around bases, and the scientists recognized that this material could be a practical feedstock. They established that PET filaments, created by recycling, were just as robust and flexible as commercially available filaments for 3D printers. 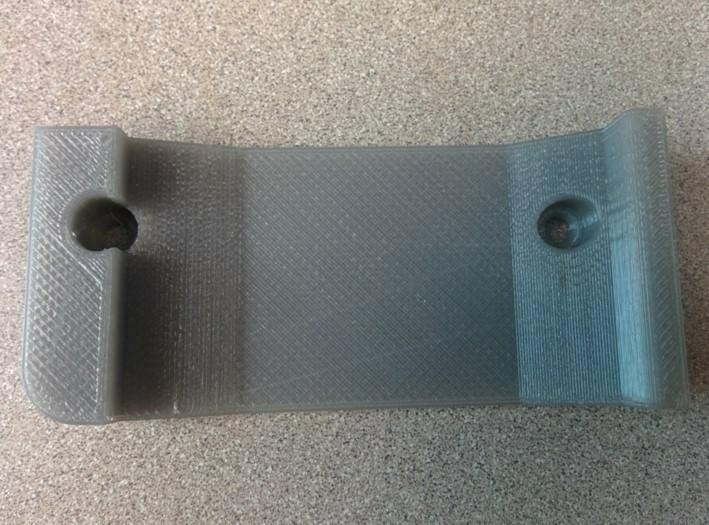 The researchers used recycled PET filaments in tests to print a vehicle radio bracket, a long-lead-time military part. About 10 water bottles were required for this process and it took around two hours to complete. At first, the scientists established that other types of plastic, such as polypropylene (PP), used in cottage cheese or yogurt containers, or polystyrene (PS), used for plastic utensils, were not ideal for use in 3D printing. Resolute, the team sought to toughen PP by blending it with wood fibers, cardboard, and other cellulose waste materials found on military bases to develop new composite filaments. Furthermore, the very delicate PS was mixed with ductile PP to create a robust and flexible filament. The scientists used a process known as solid-state shear pulverization to produce composite PP/cellulose filaments. In this process, shredded paper and plastic, cardboard or wood flour were crushed in a twin-screw extruder to produce a fine powder that was then melt-processed into 3D printing filaments. After testing using dynamic mechanical examination, the scientists concluded that the new composites had enhanced mechanical properties, and they could be used to create robust 3D-printed materials. Zander's team is constructing a mobile recycling trailer that will enable specially trained soldiers to make 3D-printing filaments from plastic waste. She is also looking for ways to print materials from plastic pellets rather than from filaments, which could help soldiers speedily produce larger 3D-printed machinery and parts. "We still have a lot to learn about how to best process these materials and what kinds of additives will improve their properties," Zander says. "We're just scratching the surface of what we can ultimately do with these discarded plastics."